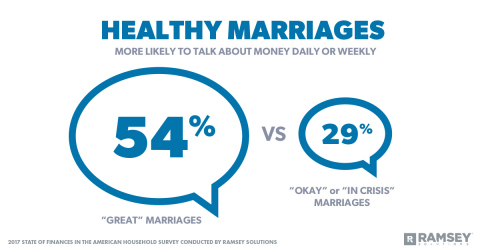 According to a recent survey by Ramsey Solutions, couples who say they have a "great" marriage are almost twice as likely to talk about money daily or weekly compared to those who say their marriage is "okay" or "in crisis." NASHVILLE, Tenn.--(BUSINESS WIRE)--The number one issue couples fight about is also a topic many couples avoid discussing — money. According to a new survey by Ramsey Solutions, money fights are the second leading cause of divorce, behind infidelity. Results show that both high levels of debt and a lack of communication are major causes for the stress and anxiety surrounding household finances. Additional survey findings can be found at www.daveramsey.com/research. According to a new survey by Ramsey Solutions, money fights are the second leading cause of divorce, behind infidelity.